Some of the stories won’t be warranted, but every now and then the hype is real. The Red Sox’ position players report to spring training on Feb. 23. You’ll hear players speak about their awesome offseason workout program. You’ll hear how they’re in the best shape of their lives. They’ve either lost weight — hello, Pablo Sandoval and Hanley Ramirez — or they’ve added 20 pounds of muscle. They’ve improved their speed and agility. They’ve adapted to the environment. They’ve found religion. They’ve found a nutrition program. Ah yes, spring training is around the corner, where hope springs eternal. ■ “This year will be better than last year. The younger players will get better.” Younger players, as Dave Dombrowski and Mike Hazen have pointed out, don’t always get better immediately. ■ “Clay Buchholz hopes to pitch 200 innings.” This is the seventh straight year for that goal, and he’s yet to reach it. Seventh time the charm? ■ “Rick Porcello will be better in the first year of his new contract.” He can only go up after a career-high 15 losses and a 4.92 ERA. Porcello is a very accountable guy so I’ll make the excuses for him. It has to be hard going from the insulation of a superstar rotation in Detroit to suddenly being perceived as a No. 1 in Boston and then landing an ace-like contract before throwing a pitch. ■ “Blake Swihart will become Ivan Rodriguez before our eyes.” Swihart finally started to show his offensive potential in the second half of last season. It will be interesting to see how he progresses. He must improve on blocking balls or pitchers will lose faith in him. ■ “Mookie Betts will be the next . . . some say Andrew McCutchen.” It’s not a far-fetched thought. ■ “David Ortiz doesn’t want a new contract, truly a first.” It seems we get a contract rant from Ortiz every spring training. The only shocking news on Ortiz this year would be if he decided not to retire. ■ “Ramirez is already saying first base should be easy.” He just needs to do it. ■ “The Red Sox vow they will not finish in last place for the fourth time in five years.” And they took enough steps to avoid that fate. But they weren’t expecting a last-place finish in 2015, either. ■ “The Red Sox won the offseason, now they must win the regular season.” So many times, offseason optimism vanishes quickly. That can’t happen this time. 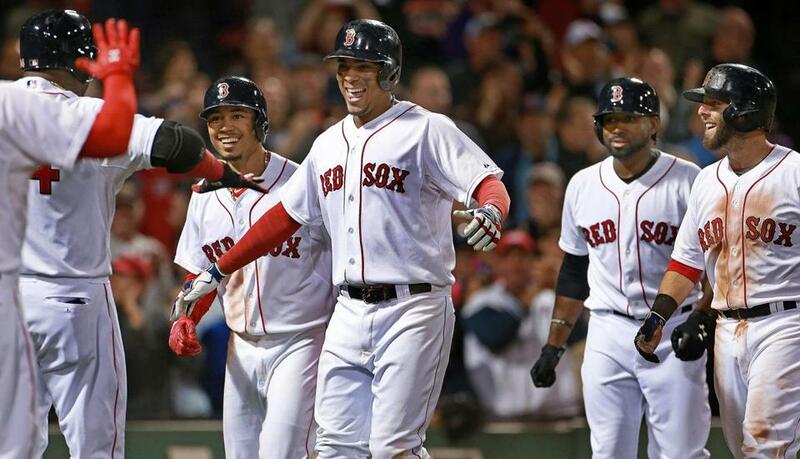 ■ “Xander Bogaerts wants to steal more bases.” I’d rather see him hit more home runs. ■ “Dustin Pedroia doesn’t believe the declining advanced metrics on his fielding.” I tend to agree with Pedroia. ■ “John Farrell returns from his bout with cancer.” This should be an inspirational story that could work to Boston’s advantage. ■ “Torey Lovullo goes from interim manager to bench coach.” Not exactly an easy thing to do. ■ “Brian Butterfield will provide glowing reports on Ramirez’s transition to first base.” Love Butterfield’s optimism. ■ “Yoan Moncada future superstar updates.” These will come ad nauseum. ■ “David Price will be the new face of the Red Sox.” He needs to be Sandoval and Ortiz in the postseason. ■ “Craig Kimbrel’s first dance in the American League and how Koji Uehara has no problem giving up the closer role.” That’s the hope. ■ “Dombrowski’s first spring training with the Red Sox and what a splash he made in his debut.” He won the offseason. ■ “If only Jackie Bradley Jr. could provide consistent offense.” Will this story line finally end? ■ “Rusney Castillo has made adjustments.” We’ll see. ■ “The Red Sox don’t need home runs; they will hit lots of doubles.” Home runs are better. ■ “The Red Sox have lots of pitching depth with Steven Wright, Brian Johnson, Henry Owens, Pat Light (bullpen). What could go wrong?” You always want your starting five to be there all year. This has all the makings of Camp Tranquility. The Red Sox are favored to win the AL East, though the Blue Jays, Yankees, Orioles, and even those poor Rays will challenge for the top spot. There were high expectations for the Sox last year when former GM Ben Cherington “fixed” the offense with Ramirez and Sandoval and added the upward-trending Porcello to the rotation. Those three players couldn’t have had worse seasons, while Yoenis Cespedes, whom the Sox traded for Porcello (nice deal by Dombrowski), went on to have an incredible season for the Tigers and Mets. If Price, Kimbrel, and Chris Young all falter, if reliever Carson Smith isn’t worth dealing Wade Miley for, then run for cover, Mr. Dombrowski. The fan base, prognosticators around the country, Las Vegas oddsmakers, they’re all in that the Red Sox solved major issues and should be the favorites in the division and the league. We will all likely fall into the spring training trap. We will likely fall in love with a new young player who will wow us in March. We will say we don’t pay attention to the Sox’ record, but if it’s really good we will go bonkers with preseason accolades for the local nine. Remember, take all glowing media reports on players with a grain of salt. Some of the stories won’t be warranted, but every now and then the hype is real. The making of Betts is a prime example. The flip side is the hype on Bradley two spring trainings ago, when he looked like the second coming of Willie Mays and it didn’t turn out that way. Shane Victorino is coming off two injury-filled seasons, looking for a team. Jonny Gomes got sick of waiting for a major league job so he took a one-year, $2 million deal with the Rakuten Golden Eagles in Japan. Too bad. Gomes was always a good sound bite and quote. And being a part of World Series winners in Boston and Kansas City (though he was not on the Royals’ World Series roster), he was a good-luck charm for contending teams. For many remaining free agents, Japan and Korea could be an alternative. Others feel like they have more to prove in the majors. Former Red Sox outfielder Shane Victorino is one of them. 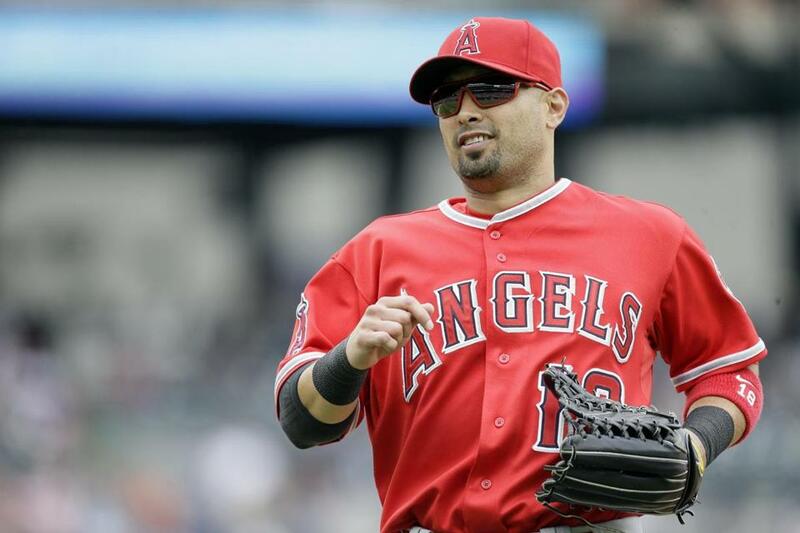 Coming off two injury-filled seasons, Victorino feels he’s thriving again. He’s switch-hitting again and he has a track record of being a winning player with rings in Philadelphia and Boston. The long list of unsigned free agents includes infielder Ian Desmond, outfielders David Murphy, Dexter Fowler, Alex Rios, and Marlon Byrd, starting pitchers Yovani Gallardo, Mat Latos, and Kyle Lohse, and relievers Tyler Clippard and Matt Thornton. 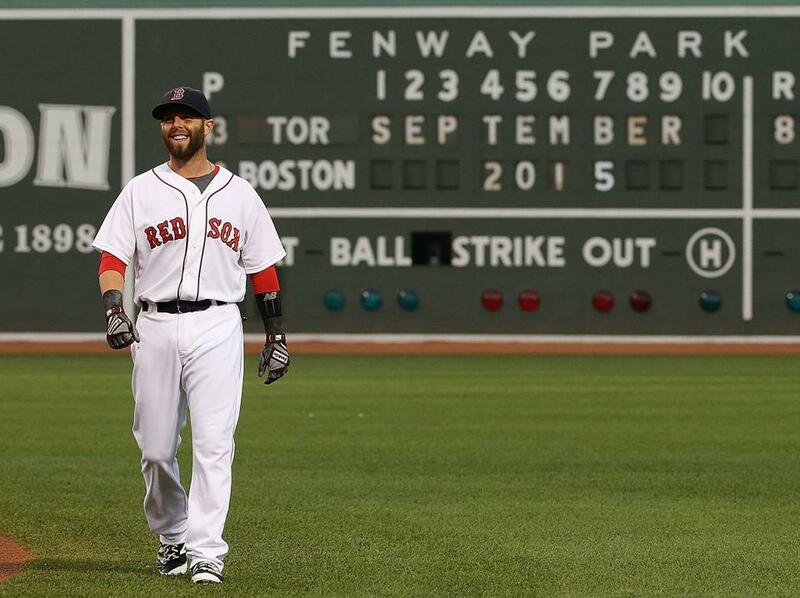 MLB Network ranked Dustin Pedroia eighth among second basemen. 1. MLB Network ranks the top 10 players at each position using advanced metrics. Craig Kimbrel was ranked 10th among relievers while Dustin Pedroia was eighth among second basemen. Kimbrel finished one spot behind the Orioles’ Darren O’Day. Pedroia finished one spot ahead of the Marlins’ Dee Gordon and one spot behind the Mets’ Neil Walker. The top 10 relievers: 1. Wade Davis, Royals; 2. Dellin Betances, Yankees; 3. Aroldis Chapman, Yankees; 4. Andrew Miller, Yankees; 5. Zach Britton, Orioles; 6. Mark Melancon, Pirates; 7. Ken Giles, Astros; 8. Tony Watson, Pirates; 9. O’Day, Orioles; 10. Kimbrel, Red Sox. The top 10 second basemen: 1. Jose Altuve, Astros; 2. Robinson Cano, Mariners; 3. Joe Panik, Giants; 4. Ian Kinsler, Tigers; 5. Josh Harrison, Pirates; 6. Ben Zobrist, Cubs; 7. Neil Walker, Mets; 8. Pedroia, Red Sox; 9. Gordon, Marlins; 10. Logan Forsythe, Rays. 2. Fenway Sports Group parted ways with troubled Cleveland Browns quarterback Johnny Manziel as a client back in January, well ahead of the Browns, who are expected to cut Manziel by March, and his agent. Red Sox president Sam Kennedy confirmed that Manziel’s off-field issues contributed to the decision. FSG represented Manziel on marketing opportunities. 3. Pawtucket’s new ownership and management team led by Larry Lucchino continue to have tough sledding, the latest blast coming from WPRO radio talk show host Dan Yorke, who got on Lucchino after he and Pawtucket mayor Don Grebien released a joint letter stating that plans for stadium relocation have been “put on the backburner” after a Providence proposal failed to garner public support. The letter acknowledged, “We fully recognize that there remain serious challenges to the PawSox given the competitive advantages newer facilities afford many clubs in the International League, and the troublesome decline in attendance at McCoy Stadium over several years. We also recognize that at least some of the 2015 decline was due to the slight many fans felt by the unsuccessful roll out of the plan to move to Providence,” a plan that “fell short of public and fan support.” Yorke felt there should be a firm commitment to staying in Pawtucket. 4. The anti-Jon Lester? Yankees righthander Nathan Eovaldi has allowed only 11 stolen bases since 2011, spanning 106 starts. Lester has allowed 99. 5. One of many things the Tigers loved about Jordan Zimmermann is that over the last three seasons he’s had 89 starts in which he’s walked two or fewer. That’s the most in baseball over that span. Zimmermann will slot nicely behind Justin Verlander as the No. 2. He was one of a handful of excellent offseason moves by new GM Al Avila, who rebuilt the bullpen with Francisco Rodriguez, Mark Lowe, and Justin Wilson, helped the offense with Justin Upton and Cameron Maybin, and added rotation depth with Mike Pelfrey. 6. Even though Daisuke Matsuzaka is pitching in Japan again, and last played for the Red Sox in 2012, he still makes his full-time home in the Boston area. 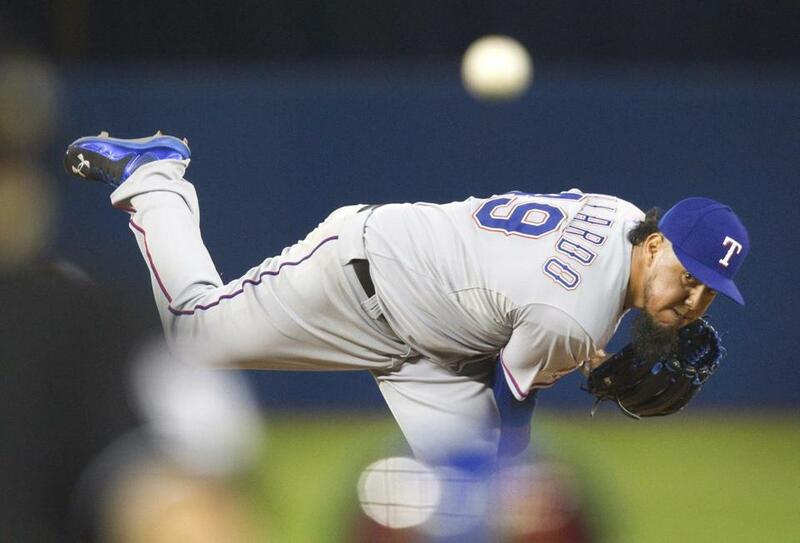 Yovani Gallardo’s market may be a team that has a protected first-round pick. 1. Yovani Gallardo, RHP, free agent — A few teams are communicating with Gallardo, but Gallardo requires compensation in the form of a first-round pick (except for teams protected in the top 10). Another problem: Before the All-Star break last season, the righthander had a decent 1.226 WHIP, but after the break it was a dreadful 1.718. Gallardo’s market may be a team that has a protected first-round pick — Miami, for instance. The Phillies, Reds, Braves, Rockies, Brewers, Padres, A’s, Marlins, Tigers, and White Sox also fall into this category. Would the Rockies, forever looking for pitching, jump in? 2. Tyler Clippard, RHP, free agent — As we’ve pointed out, Clippard’s late-season struggles with the Mets and his salary demands have kept him on the market, but the pace is picking up. The Diamondbacks have shown interest as they build a competitive team, and the Astros and Rays are among at least a half-dozen teams that have inquired. 3. Dan Uggla, INF, free agent — Uggla will likely receive an invitation to spring training on a minor league deal. While not regaining the star status he had before his concussion issues, he did show power last season with Washington. Teams have called, according to agent Terry Bross, but no commitment yet. 4. Matt Thornton, LHP, free agent — He’s 39, but his fastball velocity — just under 94 miles per hour last season — still makes him a viable option as a second lefty in someone’s bullpen. There are a half-dozen teams circling, according to one major league source. Thornton probably won’t get a major league deal, but he could find his way on a major league roster out of spring training. 5. David Murphy, OF, free agent — Murphy, 34, is still a very good player, and according to one National League scout, “the perfect fourth outfielder.” You could see a team like the Orioles going in this direction with their need for a lefthanded bat. Between the Indians and Angels last season, Murphy hit .283 with 10 homers, 50 RBIs, and a .739 OPS, and he can play all three outfield positions. Andrew Cashner had a 4.34 ERA last season. 6. 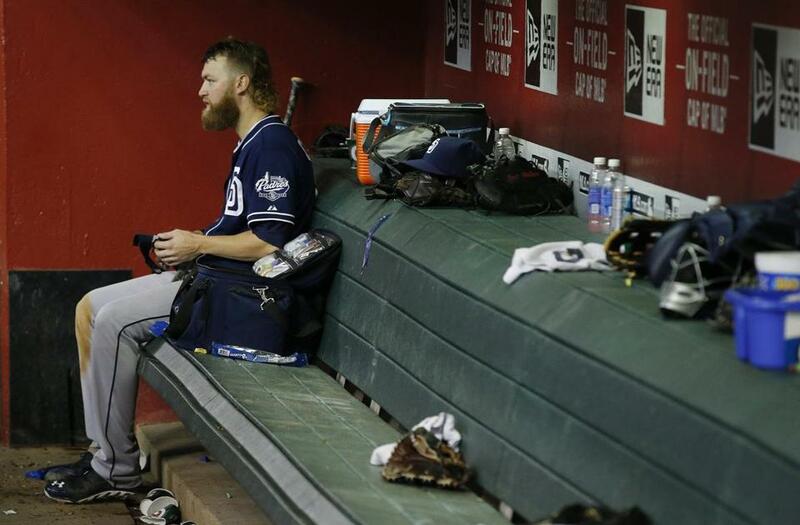 Andrew Cashner, RHP, Padres — Cashner has become a good fallback for teams looking for starting pitching. But the price will be fairly steep, which is why the Orioles, when negotiating with San Diego, settled on Odrisamer Despaigne, who had a poor year at pitcher-friendly Petco Park with a 5.80 ERA in 125⅔ innings. Despaigne will compete for the No. 5 spot in the rotation or could be used out of the bullpen. 7. Cliff Lee, LHP, free agent — There were teams kicking around scenarios for the veteran lefty this past week, but they are unsure about devoting $6 million to $8 million, plus incentives to Lee, who hasn’t pitched in the majors for most of two seasons. 8. Alex Cobb, RHP, Rays — There’s quite a bit of interest in Cobb, but the Rays are likely to hold on to their pitching for now. They boast a very good rotation with Chris Archer, Cobb, Matt Moore, Jake Odorizzi, and Drew Smyly, with Erasmo Ramirez as the sixth man. 9. Alan Nero, agent — Other than the frustration of having Gallardo unsigned, Nero has had great success finding clients jobs. This winter alone he has landed Wade Boggs with the Red Sox, who will retire his number and offer him a paid role with the team, and Lou Piniella as a senior adviser with the Reds, with whom Piniella won a championship as a manager. From the Bill Chuck files — “Mets starter Noah Syndergaard pitched 21 fifth innings in 2015 and did not allow an earned run, but both Kyle Lohse and Rick Porcello appeared in 26 fifth innings and allowed 21 ER.” . . . Also, “In 2015, the Red Sox had a 4.94 ERA in the sixth inning, while the Yankees had a 4.94 ERA in the seventh, which is why both teams shored up their bullpens.” . . . Happy birthday, Carney Lansford (59) and Juan Pizarro (79). 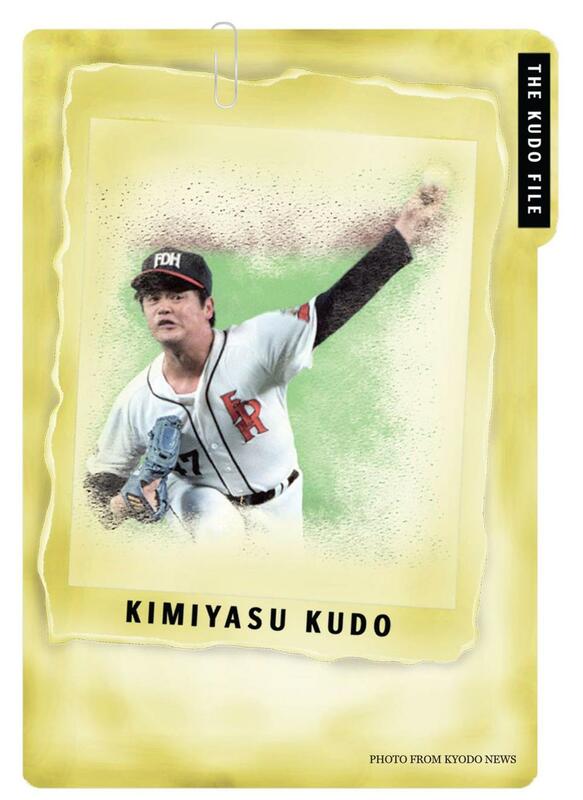 Pitcher Kimiyasu Kudo last month became just the fourth player to be elected to the Japanese Hall of Fame on his first try. The lefthander who won 224 games, was a two-time MVP, and played on 11 Japan Series champions, has one other achievement: His 29 seasons are the most by any Japanese or US major leaguer. ■ Played for the Seibu Lions, Fukuoka Daiei Hawks, Yomiuri Giants, and Yokohama BayStars. He started with the Lions in 1982 at age 19 and finished with them in 2010 at age 47. ■ Joined Victor Starffin, Sadaharu Oh, and Hideo Nomo as only players to be elected on first ballot. ■ Competed in 14 Japan Series in his 29 seasons, winning 11 times. ■ Managed the Hawks to a Japan Series title last season, his first at the helm. A look at the longest careers for Major League Baseball players (since 1960).